There are any number of interesting film festivals that play Louisville through the year. Since they give cinemaniacs a chance to view films we wouldn’t otherwise see, they are all worthy. One of my favorites — essentially because the powers that be give me access to the movies in advance and request reviews — is the Jewish Film Festival. And, there’s of course the joke I pull out every year, a play on an old Levy’s rye bread advert, the Jewish Film Festival isn’t just for Jews. You can see a synopsis of each film and schedule of the whole schmear here. The former is a fascinating. visually elegant black and white movie set on one day in a Hungarian village at the end of WWII, when a couple mysterious men arrive by train with two wooden foot locker-sized crates, setting the town atizzy. 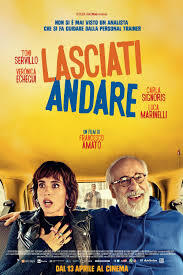 The latter is a free spirited Italian romantic comedy about a psychotherapist who needs exercise and thus meets a free spirited personal trainer. Cockamamie ensues. Check out the above link for the full festival schedule.